This action-packed opening cutscene is a fast beginning to a game that will eventually pick up the same pace. Fighting off enemies, climbing across the environments, and getting caught up in the middle of some spectacular setpieces, Tomb Raider borrows a lot from Uncharted, but this can only be considered a good thing. 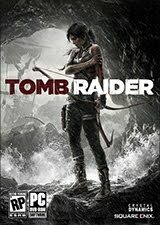 Tomb Raider 2013 takes us back to Lara's origins and presents the story in a much darker and more sinister tone compared to previous entries to the series. The story follows Lara as she adventures around the island, trying to meet back up with the Endurance crew, fighting the Solarii, and raiding tombs. The island experiences very strange weather patterns, and it slowly becomes clear that the storms are not natural, as Lara uncovers exactly what is going on. It's exciting stuff, and I constantly wanted to keep playing, to see what would happen next, but the game only clocks in at about 10 hours long. Voice acting is decent and scripted well, although the characters do suffer from being very stereotypical: the computer nerd; the big fisherman with the big heart; the strong, independent black woman; and the sly reporter trying to escape bankruptcy by any means. The plot starts off slowly: awakening upside-down in a room full of corpses, Lara breaks free only to be impaled on a decently sized piece of metal, which sets the grim tone for what we will be experiencing for the first portion of the game. These opening hours are cruel, brutal sequences that serve to show the horror of the island, and by the time she emerges from the cave she's been trapped in, Lara has already been impaled, burned and nearly drowned several times. Throughout the game, Lara takes a lot of hits, getting slowly more and more injured as various enemies, animals and the general environment make their mark. Injuries gained in cutscenes stay on Lara's body for the rest of the game, which adds a surprising amount to the gritty realism of it all. This does, however, highlight how Tomb Raider suffers from the classic double-standard of damage in cutscenes vs damage during gameplay: a cut or blow during the story results in permanent injury; bullets to the face during gameplay can be shaken off like they're nothing. This issue is nothing new or unique to Tomb Raider, so can't really be a criticism, but with strong focus on Lara as a regular human being, prone to injury, it does stand out. A short way into the story, hunger forces Lara to hunt for food. A deer is your target, and the game does an excellent job of making you feel terrible about killing it. This sequence is effective, but Lara's first human kill is a real standout point in emotional manipulation. Upon being captured, Lara makes a grab for the islander's gun and, after a short struggle, shoots him in the face, coating herself in blood in the process. Struggling to come to terms with what she's done, and visibly disgusted by this man's brutal death, the scene makes a profound impact on both Lara's character and the player. It's a shame that this sequence was slightly spoiled due to its reliance on quicktime events (QTEs), which results in death and restart should you fail one. There are games that do QTEs very well, but Tomb Raider doesn't, so it's unfortunate that there are several sequences that rely heavily on scripted button mashing. There's only so many times you can fail and watch Lara get killed before the scene loses its impact and slips into being annoying, as you miss a button press by a fraction of a second for the fourth time in a row. But the questionable use of quicktime events isn't the main problem with this scene. Both first-kill sequences suffer from making a huge point about how difficult it was to take a life, animal and human, but are succeeded by shootouts that required you to kill dozens of enemies, all without futher complaint from Lara. This was a real low point in the story for me. This change definitely needed to occur, but it shouldn't have been so instant. After this point, gameplay drifts more towards third person shooter, and while general gameplay holds up well, it is lacking in a few areas. The guns themselves seem fairly weak and very inaccurate, only really becoming reliable when you've invested a fair amount in upgrades. Most of the time, I opted for my trusty bow, especially when I unlocked the ability to set the tips, and thus enemies, on fire. In a gun v bow situation, it doesn't seem right that the bow should come out on top, but in Tomb Raider this is often the case. A cover system is included, but is entirely context based so there isn't a specific button to take cover: you just sort of walk up to it. For the most part it works fairly well, although the lack of user input is a matter of trusting the game on making cover decisions. Once your into cover however, you only have one option: stand up and fire. There is no blind fire, which seems like a glaring omission. Firing while climbing is also impossible. For when you're out of ammo (which is rarely due to the amount of ammo caches around) the game also features a basic melee system, which doesn't go beyond swinging your pickaxe at people during one on one combat, but stealth attacks from behind and melee finishes are a nice addition, if a little limited in terms of varying the animations. There are some stealth based sequences, which is often based on waiting for enemies to stop talking and split up or observing guard routes to pinpoint a spot where enemies disperse from groups - standard stealth stuff. Once alerted, enemies don't seem to lose sight of you so take it steady if you don't want a shootout. Most enemies are standard Solarii grunts, armed with firearms or bows, who you'll be engaging in shootouts with. Some enemies, especially early on, run at you with melee weapons. Others have pipe bombs that are thrown behind your cover to flush you out. Other special enemies include shielded enemies, whose melee needs to be dodged so you can counter them while they're off balance. Another huge miniboss character needs to be dodged so you can shoot him in the back where he has no armour. Early on there's also some run-ins with wolf packs, which is a nice change of pace, but these are the only hostile animals in the game. These enemy types serve to mix things up so you're not constantly shooting the same things, but they're nothing unique to Tomb Raider. Other elements of gameplay include climbing and completing puzzles. The climbing mechanics are good, if a little linear, and allow cinematic leaps between tiny grip points. Craggy rock faces can be scaled with the pick axe, and a rope arrow can be fired at certain points to create ziplines. Puzzles are a lot more physical than previous games, and don't require too much logical thinking, being based mainly around burning things and physics. If you do get stuck, you can use Tomb Raider's Survival Instinct mode, which turns the world black and white, with key items and waypoints highlighted in yellow. Campfires dotted throughout the game allow access to upgrades and quick travel, as well as acting as definite checkpoints and sometimes cuing Lara to read out a journal entry. Here, both Lara's physical skills and her weapons can be upgraded. Skills are improved by earning skill points through the game's XP system, which awards various amounts of experience for actions such killing enemies and animals, finding collectibles and clearing optional tombs, as well as general story progress. Skills are tiered, requiring a certain number of upgrades to be bought before the next tier unlocks for purchase. Weapon upgrades utilise a similar method, but cost a specific number of salvage, a kind of currency system which can be collected throughout the island by breaking open crates and looting corpses. Upgrades change both weapon performance and appearance. Graphically, Tomb Raider is very impressive: characters are very detailed, and move nicely with smooth animations; environments are detailed and have far render distances, allowing you to look out across the cliffs and mountains to see landmarks from far away; and the water is very pretty, with reflection, refraction and ripples seen in abundance. Fire effects are probably the most disappointing. Despite being well animated and hooking into the game engine's excellent lighting system, flames disappoint by occasionally failing to conceal their 2D nature, which really detracts from the effect. The result of setting fire to objects is also underwhelming, as they simply crumble up and disappear once they have burned for a sufficient period of time, which looks a little strange to say the least. Tomb Raider makes use of the brand new TressFX system to dynamically render Lara's hair, and it does look amazing. It's not perfect, but it's a step in the right direction. Hair effects have been lacking behind other visual improvements in recent years, so it's very impressive to watch as strands flow over Lara's arms and shoulders, reacting to movement completely under physics. The illusion is lessened upon close inspection where it becomes clear that collision box on Lara's back is slightly offset, resulting in floating hair, but this is something I'm sure could easily be patched. The biggest complaint about this system, however, has to be a combination of the FPS overhead TressFX causes, and the fact that despite being through constant mud and dirt, Lara's hair always looks silky smooth. The PC version is a decent port. It looks and plays great, and there's a ton of in-depth graphics options available to tame the framerate if it doesn't. I never get along with PC controls for third person games, so the native support for an Xbox controller is welcomed. FPS is pretty solid during normal gameplay, but if you've got an nVidia graphics card, you're going to struggle running TressFX. While we are assured that both Crystal Dynamics and nVidia are currently working on fixes, at the moment the effect can cause frame rates to crawl to slideshow levels. Build 1.0.722.3 has been released for the PC version of Tomb Raider, which offers, among other things, promise of TressFX improvements. Putting in some gametime, it seemed as if the patch had made small improvements to framerate, but this seems to have been a placebo effect as actual figures suggested otherwise. I ran some tests with the game's benchmark feature, on both the brand new patch and the build that was previously reviewed (1.0.718.4), which you can downgrade to by using Steam beta access. It was benchmarked at 1080p with everything turned to full - with the exception of anti-aliasing set to FXAA, as SSAA caused it to crash - and V-sync on. The new patch gave an average of 25 FPS; the old patch: 25.5 FPS. So the new patch is, in fact, slightly slower than the old one, although in reality the difference is negligible; in both cases, turning hair effects to standard gave a huge bump to frame rates, increasing benchmark performance by nearly 15 frames. Admittedly, during normal gameplay my frame average was nearer 45, but this does give a feel for the sort of performance you will experience during close shots in cutscenes. For me, performance did not noticeably improve, but it's still worth updating for the bug fixes. It's good to see Crystal Dynamics listening to the community and supporting the game post-launch, but improvements still need to be made to TressFX. Luckily, we have been promised further patches for the game, as well as driver updates for nVidia cards. I will update as they do. nVidia have released new drivers for GeForce 400, 500 and 600 series graphics cards, with patch notes promising improved performance for Tomb Raider. After the underwhelming performance improvement of a previous update for the game itself, I was pleasantly surprised when the new drivers made a notable difference to framerates. Benchmark average framerate increased to around 35, an impressive improvement of about 10FPS. This performance increase continued into gameplay as well, with FPS seeming much more consistent. Unfortunately, low frame rates when focus is on a lot of Lara's TressFX hair are not completely eliminated, but they occur much less frequently and with slightly smaller drops in FPS. Overall, Tomb Raider is a really fun game that looks great and plays well, marred by some gameplay shortcomings, performance issues and a short story length. The ending certainly suggested that Lara was up for some more adventuring so hopefully we'll be seeing another Tomb Raider title to continue this new series.